greenpixie: first warbler of 2009! First backyard (well, front yard) warbler this morning! And it was my favourite, the black-throated green. I didn't see him, but I heard him singing. His zee zee zee zoo zee! 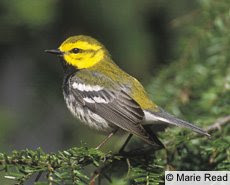 was the very first warbler song I recognized, one of the first birdsongs I recognized, in fact, and is my favourite birdsong despite the fact that it's not particularly melodic. It's just so emphatic and happy. I almost couldn't believe my ears... but there he was, and there was no mistaking him. Hooray!